Every day at DIY Doctor we get questions (lots of them!) about how home owners can increase the insulation in their loft as per building regulation guidelines while, at the same time, being able to maintain the storage space the loft or attic offers. First, lets deal with the questions of what the Building Regulations actually say. Contrary to popular thought, they do not actually say that the loft insulation you use now has to be 270mm thick. What they do say is that the loft insulation needs to meet (wherever physically and feasibly possible) the minimum energy and efficiency values set out in the Building Regulations Approved Documents. 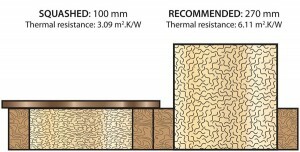 In order to do this, it has been assessed that most roofs in the UK need to contain a layer of insulation 270mm thick. This is an increase of 170mm from the old 100mm layer of fibreglass insulation placed into most home. The mineral wool insulation used today is extremely energy efficient. The problem arises of course when a loft containing 100mm of insulation and 125 suitcases needs to be emptied to install another 170mm of insulation. What happens to the suitcases? The answer is of course that (because no one from the Governments various “Think Tanks” has told the Energy Savings Trust to spend a lot of money making the necessary information available to the public) as soon as the new thickness of insulation has been placed, the suitcases go back on top of it; squashing it back down to just over the 100mm we started with ! We have decided to use this blog, today and tomorrow to explain as best we can, how to make the very best use of your loft space, while staying in-line with Government regulations . Firstly, what not to do! Squashing your insulation simply reduces the effectiveness of the new layer to the point where there is little sense doing it in the first place…..But they don’t tell you these things do they? A company called LoftZone, who specialise in loft flooring over 270mm of loft insulation have been working with the NPL – National Physical Laboratory – who specialise in applying the most advanced and accurate measuring standards, science and technology available to bring the problems of squashed insulation to the public attention. We are doing our best to help! As you can see, squashing loft insulation is not a good thing! In tomorrow’s blog we will look at the answers to the question:- How can I increase the insulation in my loft and still be able to fill it up with all the rubbish I don’t have room to put anywhere else.